Navigator Elegance Is A Full Fledged Internet Navigator With Elegant Design! Tired of the same old look of your internet browser? It's time to try our newest and most elegant navigator, Navigator Elegance. Designed to give you pleasurable browsing experience, Navigator Elegance is among the most beautiful browsers around! As for functionality, Navigator Elegance is capable of all the common functions you expect from an advanced browser. 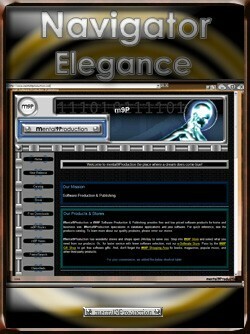 Navigator Elegance full version is priced only $10.00. Buy it directly from this site or try it free for 30 days. Purchasing Navigator Elegance is safe and secure. We use Secure Socket Layer (SSL) to protect the security of your credit card information.